« On behalf of Leila and Arab, thank you for your email and following up on the mortgage funding that you provided to us in December. They really appreciate everything that you and your team have done for them as this really alleviated a lot of their financial concerns so that they could live comfortably within their retirement. Thank you very much for the “The Mortgage Code”. I was surprised and also felt very honoured to receive this book. You have helped and continue helping many people from all walks of life with your expertise. Your passion and commitment to empowering people and helping them save money is something very special. You have saved people hundreds to thousands of dollars on their mortgage. I’m sure there have been a few tissue times when they thought it was impossible. The service I received from » Angela Calla Mortgage Team » was above and beyond my expectations. The team delivered with true concern and customer care. The personal touches and the professional ability to help with my financial issues made the whole process very easy and comfortable. An outstanding experience and team !! I would highly recommend them. Thank you so much for your team’s assistance, support and professionalism. With my current medical situation, I wasn’t sure how much more stress I can take. Thank you again. Hopefully, you can help us again in the future. 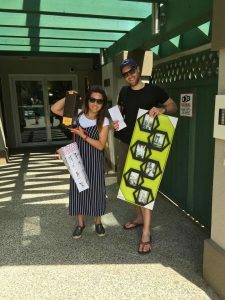 A massive congratulations to Greg and Zoe of Burnaby! They purchased their first home and have become part of The Angela Calla Mortgage Team’s extended family. We can’t wait to help guide them through this mortgage term and in their future endeavors. I wanted to thank you and John for all of your help. I appreciated how quick John was to answer any questions I had and how transparent he was through the entire mortgage process. As a first time home buyer I also appreciated the extra information John provided me so I would have a further understanding about credit scores, rates and mortgages. Thanks again and I look forward to working with your team in the future!